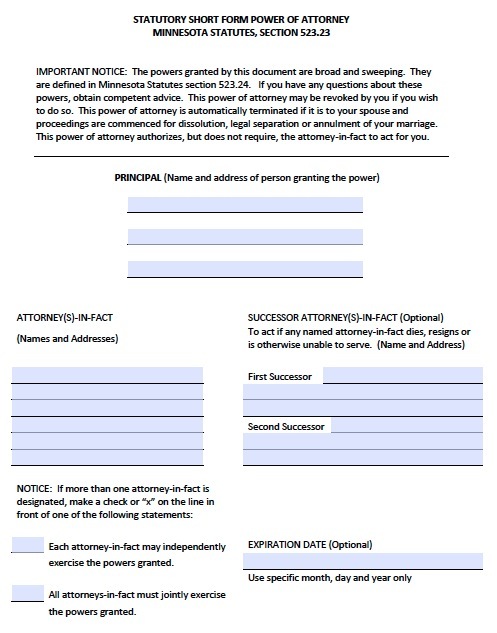 The standard Minnesota power of attorney form lets you grant the power to do anything permissible under Minnesota law to your agent regarding a wide range of financial matters. You can simply check off each item to indicate you want the agent to have control over that subject. This is convenient if you only have one or two transactions you need an agent to perform, like picking up payments and depositing them in your accounts. Alternatively, you can indicate that you want the agent to have control over all the listed subjects and any other property and financial matters Minnesota allows under power of attorney agreements. Next, you have to decide whether you want the document to remain in force if you become incapable of making decisions. The form also allows you to authorize the agent to transfer your property to him or her, and you can require the agent to keep records of his or her transactions.